Adam Milner, set to return from injury. Castleford Tigers boss Daryl Powell is backing his team to respond after letting down their huge travelling support in France last weekend. 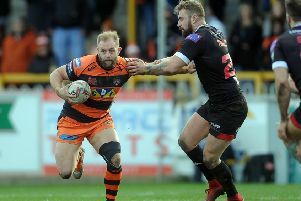 Tigers fans travelled in huge numbers for the game against Catalans Dragons, but were not rewarded by a good display as a 44-16 defeat did not flatter Cas. But head coach Powell is confident it will be a different Tigers team that takes to the Mend-A-Hose Jungle pitch this Sunday when Leeds Rhinos are in town. He told the Express: “We have got to move on and beat Leeds this weekend. “It was a tough day and disappointing that we just didn’t get out of the blocks really. “We made errors, put ourselves under pressure and they played well. It was just an off day for us and it was very disappointing for the amount of supporters that went. They were fantastic, getting over there in such numbers, and we didn’t do it any justice, which I am really disappointed about. “We need to give them something to cheer this week. “We’re looking to bounce back straight away, of course. We need to respond and we’re generally very good at responding to defeat – and we’re going to need to be this week. Powell spoke of the important part the crowd can play. He said: “I thought against Wigan the crowd was superb. “We were obviously in a tough battle, we had 11 players missing, and they got behind us. Castleford could be boosted by the return from injury of three first team stars. Winger Greg Eden (hamstring) and forwards Adam Milner (back) and Joe Wardle (rib) are all in contention to come back into a side that was without 11 players for the Wigan game and nine for the match at Catalans. Powell explained: “It looks like we are getting some players back. “I think Greg Eden, Adam Milner and potentially Joe Wardle will be back this week so that strengthens us and gives me a few options.